~Feature Friday Crafts~ WEAKNESS FOR WREATHS! Here are a few features I just fell in love with over this past week. 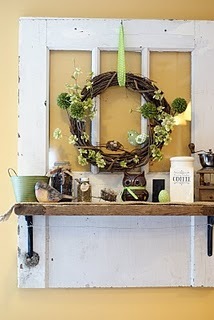 WE WILL CALL IT…..
First up this darling spring wreath over at The Little Green Bean HERE and look at the cute old weathered door its on… all of the little touches are just so darling. Look at this cute BURLAP wreath Samantha made at Mommy’s Timeout HERE! I love the colors and the flowers, its just so darling! 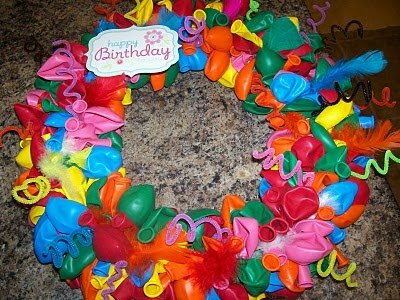 and CHECK out Becky’s new craft BLOG~ “Random Acts of Obsession” HERE AND look at the cute clever darling Birthday Balloon wreath she made, its so colorful and fun, it SCREAMS P-AR-TY! P.S. MAKE SURE AND GRAB MY “I WAS FEATURED..” BUTTON ON THE LEFT HAND SIDE OF MY BLOG! KEEP THE CRAFTS COMING YA’LL! Thanks cute blogger friend. I am slowly getting cute stuff on my blog. I definitely need to spend an afternoon or morning with you…begging for your help in making my blog cute and simple like yours. Fun, though for sure. I am kind of becoming obsessed. LOL! GOing to try to make it to work out on Friday, its just a long drive. OMG!! I love that birthday balloon wreath!! Wonder if I can churn one out by Gage’s birthday tomorrow?? so cute! ya’ll are so fabulous!